Let us introduce a unique in its functionality and cost professional employee tracking software to monitor and manage your employees' PC activities, HT Employee Monitor. The multi-functionality of the program covers most of the tasks to ensure the best monitoring of staff performance. Our employee tracking software can record all PC activities - visited websites, launched applications, search queries, computer time and screenshots as well as block any non-work-related activity specified by you. Thanks for the software. It repeatedly saved our business from leaks and theft of commercial information and helped us improve discipline. The app is invisible to users, very fast and does not slow the computers. The program is indispensable for business. - Clarice D.
Managers and business owners often suffer from dishonest employees. Employee tracking software has become a necessity. I want to thank your team for quite unique in terms of the price-quality program. - Jack M.
I am happy with your product! Now I can control actions of employees, monitor how efficiently they use working hours. Thank U! - Kumar A. See each employee's computer activity like the palm of your hand. All data is continuously recorded and provided in a convenient, intuitive form. 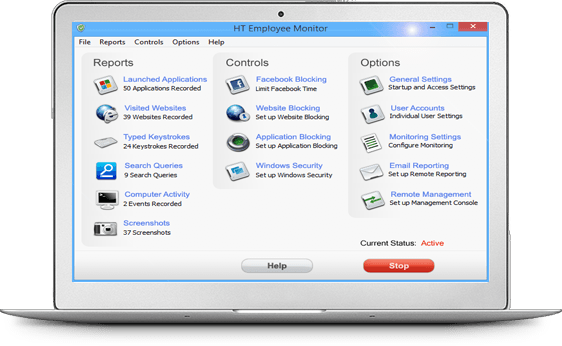 Install HT Employee Monitor to block or limit all non-work related activities on your workstations. Employee tracking software is a powerful tool for taking control of unscrupulous employees. Maximize productivity and achieve results. The software automatically tracks all computer activities and provides you with detailed local or remote reports, so you can see when your employees start and finish work, how much time work, which sites and apps visit, how often they are distracted from work and much more. You can see what sites or apps employees visited as well as block access to inappropriate ones. This is especially useful if some employees spend too much time on non-work related sites and programs. You can block access to social networks, entertainment sites, etc. HT Employee Monitor starts automatically tracking all computer activity immediately after the installation. You do not need even make any settings. The software does not show itself silently working in the background invisible to users. Opportunity to view reports and manage filter remotely from the monitored computers makes employee tracking easier and faster. One more option helps you monitor your computers when you are far from the office. Emails with reports will help you control your staff from anywhere in the world. You get not only a long list of sites and applications but visual charts. Thus you can immediately evaluate how much time an employee spent working for the business, and how much for personal. The software has an intuitive interface and does not require any knowledge to install and use. Employee tracking software will help you understand where the time goes and determine loss of working time. With employee tracking software, you can find out what causes reduce productivity and fight with them blocking or limiting time-wasters.